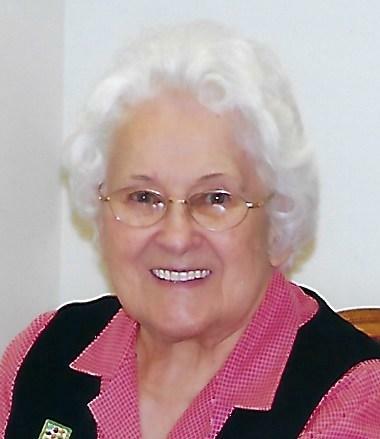 Marguerite Schneider (nee Harzmann), 104, of Oconomowoc, WI (formerly of Lenzburg, IL), was called to be with her Lord and Savior on Tuesday March 12, 2019 at Shorehaven (Lutheran Homes of Oconomowoc) in Oconomowo c, WI. Marguerite was born January 20, 1915 at home near Marissa, IL to Theodore and Anna (Reppel) Harzmann. She completed two years of secondary education at Marissa High School, but she was a life-long student, with many books in her library, especially related to gardening and homeopathic and natural remedies. She was a “domestic engineer” and finished her “career” as the “CEO” of the in-house convenience store at Lake Terrace Apartments in Oconomowoc. Marguerite married Paul E. Schneider on April 30, 1949 at St. Paul Lutheran Church in New Athens, IL, being the first wedding in the new church. Paul preceded her in death in 1993. She is survived by her two children, Ron (Connie) of Eastman, WI and Barb Roberts of Salem, IL. In addition, she is survived by 4 grandchildren, Clint (Jen) Schneider of Plymouth, MN, Eric (Tracy) Schneider of Oconomowoc, WI, Lynn (John) Montague of Sun Prairie, WI and Ben Roberts of Shasta Lake, CA and 8 great-grandchildren, Casey Schneider, Nick Schneider, Ethan Schneider, Anna Rae Schneider, Lucas Montague, William Montague and twins Dylan and Abby Montague. She is also survived by one sister-in-law Loraine Schneider of Addieville, IL and numerous nieces and nephews. Marguerite was preceded in death by her husband, her parents and twin infant brothers. Marguerite was proud of her German heritage and of her farm life. She loved animals, especially her cats and dogs in Lenzburg. Her green thumb was legendary, tending to a large vegetable and flower garden until age 86. Even after she moved to Oconomowoc in 2001 to be near her son, she tended to a small garden and to plants in her apartment as long as she was able. She was a member of St. Paul’s Ev. Lutheran Church in Oconomowoc, WI and AARP. Her volunteer activities at Lake Terrace Apartments in Oconomowoc included managing the in-house convenience store and being the head “schnitzer” of the greeting card re-creation group. Memorials may be made to Lutheran Homes of Oconomowoc (Shorehaven), St. Paul Lutheran Church, New, Athens, IL , St. Paul’s Ev. Lutheran Church, Oconomowoc, WI or a charity of the donor’s choice. Her memorial service will be held on Saturday March 23 at St. Paul Lutheran Church in New Athens, IL. Friends and family may call at the church from 9 to 11 am, with the memorial service at 11am. Burial at the Marissa Township Cemetery, Marissa, IL will follow. Heil-Schuessler Funeral Home in New Athens, IL is in charge of arrangements..